Image Size: 36 X 12 in. It's finally here " Usual Suspects Too". Based on the movie " The Usual Suspects", this time around you can clearly see who the trouble maker is and who has something to hide. Once again Blu finds himself in the line up due to guilt by association. "Usual Suspects Too" will also come with a complimentary 10 X 12 in. 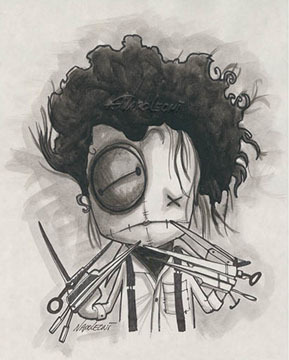 paper print of " Marcenivo Scissorhands". The canvas and paper will have matching numbers and must be sold together.